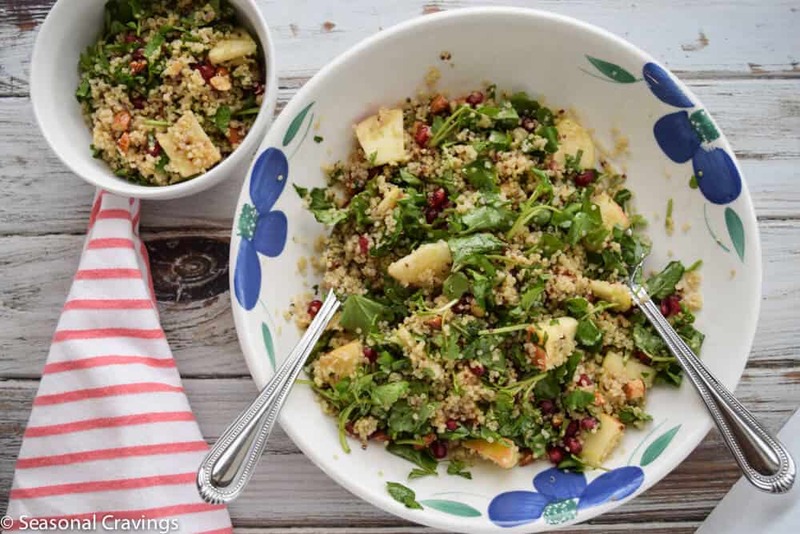 This healthy Quinoa Salad with Watercress, Pomegranates and Apples is the perfect fall salad showcasing all the delicious produce available. It’s salad time here at the Kelly house. We all need a salad to eat after overindulging in turkey, mashed potatoes and rolls (with butter). I didn’t just overindulge on Thanksgiving Day – I managed to eat leftover mashed potatoes with gravy for three days straight. Why on earth did I make so many mashed potatoes? Heaven forbid we would run out! Not a good idea. I’m wearing my stretchy yoga pants for the week. If you have the same problem, I’m here to help. 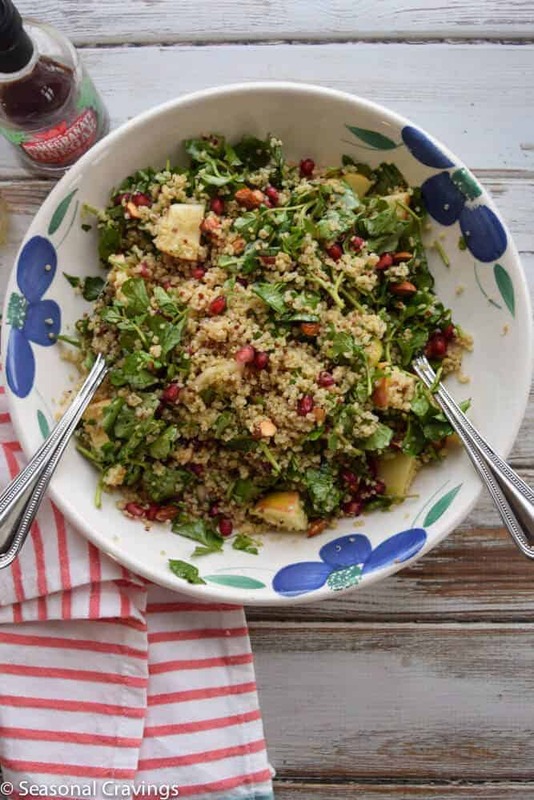 This Quinoa Salad with Watercress, Pomegranates and Apples showcases all the yumminess that fall has to offer and it will help you get back into your skinny jeans. It’s sweet and tart with a crispy crunch from Honeycrisp apples. The dressing is light and sweet. Add some leftover chicken for extra protein power. How was your Thanksgiving? Ours was simple and sweet. We hosted hubby’s parents and had a traditional meal with no quinoa or watercress in sight. Trust me, that’s the way they like it. Creamy mashed potatoes, creamed corn casserole, roasted green beans and stuffing out of a box. Yes, it’s true. That is the preferred way to eat stuffing here so I wasn’t going to rock the boat too much. Oh yeah, and we had turkey too. I make it the Tyler Florence way with sage buttered rubbed under the skin, onions and oranges stuffed in the cavity and basted with pure maple syrup. Yum. Last year I had strep throat for Thanksgiving and we couldn’t travel. It was terrible. On the bright side, my hubby and kids rallied to prove their worth. They went shopping for the entire meal and made it all themselves while I laid in bed and waited for my antibiotic to start working. It was truly the sweetest of Kelly family memories for me. And can you believe, the food was good; right down to the instant mashed potatoes? XO hubby! You rock! 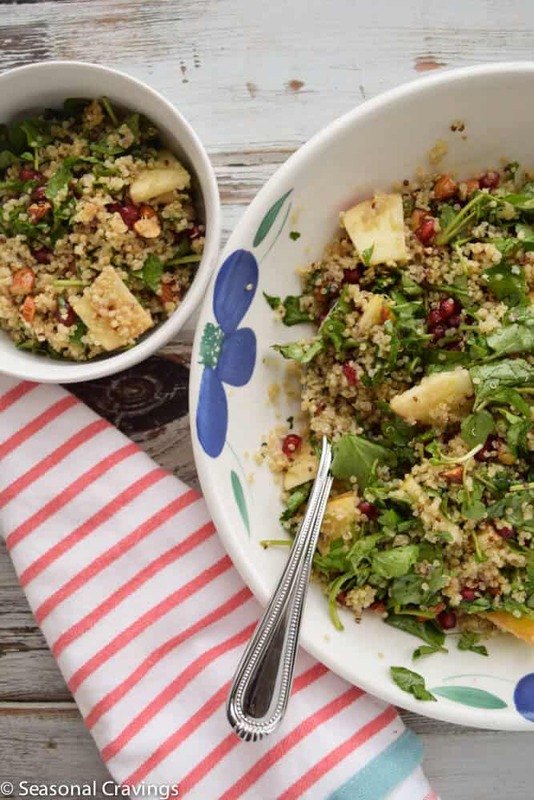 Quinoa is the gluten-free superfood of the year! If you would like to learn more about the many health benefits of this grain, check out this detailed article on Well-Being Secrets. 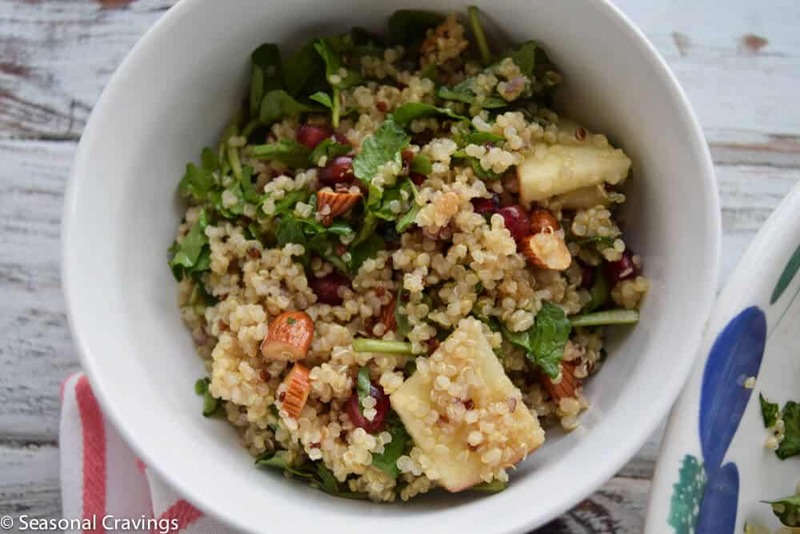 The perfect quinoa salad showcasing all the goodness that fall has to offer; watercress, Honeycrisp apples and pomegranates. Mix dressing ingredients in a small jar and shake well. 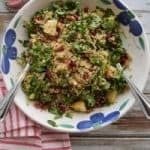 Add all salad ingredients in a large bowl and toss. Will keep in the fridge for a few days.